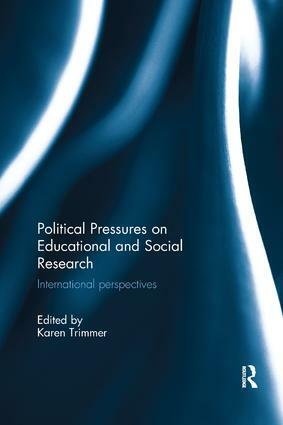 Political Pressures on Educational and Social Research draws upon a variety of theoretical and methodological approaches to consider the problems that can arise when research findings diverge from political directions for policy. Chapters explore the impacts this can have on the researchers, as well as the influence it has on the research, including the methodology and the publication of results. The book offers innovative ways of seeing how these connect, overlap and interact, revealing particular issues of concern for researchers and evaluators in the context of research internationally. Key topics include the power and positioning of research, evidence based policy development, ethics and the importance of research that seeks to explore and discover knowledge. The book is divided into two sections. The first presents chapters from international academics, which provide a theoretical underpinning and discussion of power, policy, ethics and their influence on research resourcing, autonomy, purpose and methodology. The second section explores specific case studies and instances from the authors’ own experiences in the field. This bookoffers an interesting and enlightening insight into the sometimes political nature of research and will appeal to researchers, evaluators and postgraduate students in the fields of education and the social sciences. It will be of particular interest to those studying research methods. Play the game or get played?